Delicate blooms with a hint of fragrance describe this group of early flowering camellias. The species Camellia transnokoensis from Taiwan provides a wonderful contrast in size, with its dainty white flowers, surrounding the larger deep pink flower of the Camellia sasanqua cultivar Hiryu. Variation to this display is provided by the ruffled pale pink flowers of Camellia sasanqua cultivar Jennifer Susan and the larger white flowers of Camellia sasanqua cultivar Setsugekka. All these camellias are located together along the very top garden bed of the Plant Explorers Walk bordering the parking area. There are also a few Camellia sasanqua in the Residence Garden. The true wild Camellia sasanqua is a small tree occurring in the evergreen coastal forests of southern Shikoku, Kyushu and many other minor islands as far south as Okinawa in Japan. Usually found growing up to an altitude of 900 metres, Camellia sasanqua is not considered by the Japanese to be a true Camellia as they call it ‘Sazankwa’ meaning the ‘plum-flowered tea’. 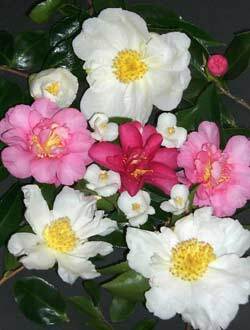 In Japan, the Camellia sasanqua has a long history in cultivation for practical rather than decorative reasons. The leaves have been used for centuries to make a form of tea and the seeds or nuts have been a thriving Japanese industry long before there were any written records. Prior to the use of oil from whales and fossil fuels, the oil from the Camellia seeds or nuts were used for lighting, lubrication, and above all, for cooking and cosmetic purposes. Camellia oil has a higher calorific content than any other edible oil available naturally in Japan. Calorific value is the amount of heat that can be produced by the complete combustion of a given quantity of a substance. The Camellia oil is difficult to extract and quite time consuming. Therefore, it has made it very hard for the Camellia oil industry in Japan to compete with sunflower, corn and other imported oils. Nowadays, Camellia seeds or nuts are used mainly in cottage industries such as for making doll's eyes and for many other novelties for the souvenir trade. Camellia sasanqua was not known in western societies until 1869 when Dutch traders imported some specimens into Europe. However, due to the cold European winters sasanquas were not as successful as they have been in Australia and many of the southern states of the United States of America.